After receiving some advice from Gary at Atlantic Cycling, we’ve modified our planned route across Newfoundland and added some more riding in Labrador. This ferry runs only once a week. If it doesn’t look like we’ll make it for July 24th, we’ll pick it up on the 23rd at Sept-Ilse. This ferry runs only once a week, so if we arrive a day late, we’ll take it up to Goose Bay for a brief visit before heading to Lewisporte. This portion of our trip is planned from July 4th to August 26. We do have some flexibility, so we may extend it to Aug 30 if we need the extra time. If we are feeling brave (or crazy) we may join Atlantic Cycling for their annual three day tour of the Cabot Trail on Labour Day weekend. Maybe by then we’ll be up for tackling the hills! Once we complete stage 1, we’ll have a short visit with Scott’s sister and family in Fredericton, New Brunswick. Then, we will need to find our way to Charleston, North Carolina where we catch a freighter on or about September 21st to Antwerp Belgium. This is a story based upon the events of Wednesday, May 14, 2008. We headed down to Alfred Station NY to pick up our new bikes, and then onto Stony Fork Pennsylvania to camp. It had been warm during the day, but as evening approached the temperature dropped. On the drive down to Stony Fork a few spits of rain came down from the sky. The weather was not looking promising. We discussed the option of taking a cabin rather than camping, since we were both cold and the weather was not looking good. When we arrived, we asked, only to discover that all the cabins were rented. Our options were tenting or backtracking to find a hotel. It was already 8 pm and we were hungry and tired after a long day, so we opted for camping. We selected a campsite and quickly began our regular camp chores: Scott setup the tent and I prepared dinner. I immediately added a layer of clothes, and the chill I had went away. Once I was warm, I began to enjoy the camping experience. By the time the tent was set and dinner was ready, it was 8:30 pm and the sun had set. We ate dinner with the last whispers of twilight. During supper we heard a loud whiny crying sound. I suggested to Scott that the sound was from an odd bird: the sound was vaguely Canada Goose like. Scott suggested that the bird was clearly in some kind of distress. Within a couple of minutes we heard a loud crashing sound in the woods approaching our campsite. It was clear that a large animal was in the area. I started talked to Scott loudly. We pointed our lights in the direction of the sound, asking what or who was there. I also looked for some metal, and began banging the pot lifter onto one of the pots. At the sound of the metal clinks, the motions of the loud animal appeared to quickly move away from our campsite. Scott suggested that it might have been a deer. In the back of my mind, I was thinking that it was much larger than a deer! We finished our dinner and cleaned up. We did not hear the whiny crying or loud animal again. After supper we recessed to the tent for our evening reading and sleep soon followed. We were both exhausted after a long day of driving and cycling. I was surprised at how well I slept – in the back of my mind, I was pretty certain that the “large animal” I had heard was a bear, and that the whiny crying was that of a bear cub. In the morning, we received confirmation. When we talked to one of the campsite conveners, he mentioned that a mother bear was in his dumpster and that there were two cubs whining or crying as they were not big enough yet to crawl in themselves. Several people at the campsite saw the bears on the other side of creek while we were enjoying our dinner – blissfully unaware of the bears presence. I am glad the bears were around while we were having dinner and not later in the night when we were sleeping. We were able to scare them off, and they did not return. We did ensure that we had a couple of metal tent pegs at our reach, so that we could bang them together if we heard any “large animals” rustling through the woods. I was amazed at how well that worked (or at least it gave us the appearance of being effective!). During a break in the ACM action, I came home and tackled a project I’d been putting off for some time. I opened up the box containing my university notes, and recycled many of them. This box has been taped shut for more than a decade, and through several moves. A technical report on my implementation of Internet tools at Northern Telecom in 1994, including Usenet, Gopher, and that most modern of tools: World-Wide-Web, with Hypertext links! I kept most of this, as well as many of the notes from my commerce courses, but the majority of Physics, Math and Engineering Physics notes went into the recycle bin. As I let them go, I felt like the knowledge contained in them was lost, but I reminded myself that it was unlikely I would need it again. If I do, these are not insights into the nature of the universe, they’re undergrad course notes. Somehow, I’ll find the information again, probably faster than if I had to dig through my course notes. I’m glad I finally did it, and also that I took the time to glance at everything, say goodbye to the things I discarded, and keep a few of the small treasures. This is a really quick update, as we are participating in the Canadian Unitarian Council’s Annual Conference and Meeting this weekend. I’ll try and update with more details and pictures pictures sometime this weekend. We successfully picked up our bikes this week. We made a quick trip down to Afred Station NY to get the bikes, and we camped out at Stony Fork Pennsylvania. On the freighter front, the boat we were hoping to take from Montreal is no longer running on the route, so we are now looking into US departures. There are no US departures to Italy that take passengers for segments. I’ve managed to get a tentative booking from Savannah Georgia (we are looking to change the pickup to Charleston NC) to Antwerp Belgium on or about September 19th. This works well as it gives us a little bit more time to get to the boat. We’ll also have an updated Newfoundland and Labrador itinerary based upon some advice from Gary at Atlantic Cycling. We are slowly but surely getting ready for this trip. The reality of it all is setting in. Completed our immunizations (all that needed to be done before we leave North America. We still need to take the Cholera vaccine just before we leave North America). Completed our Servas interviews. We have our signed and stamped letters of introduction. We are awaiting host lists, so that we can begin connecting the people we hope to meet throughout our trip. Rented our house for July 15th. Began packing up the house, giving things away, and moving things into our storage locker. Reserved the ferry from Natashquan to Blanc-Sablon, Quebec for July 24th. Reserved the ferry from Argentia Newfoundland to North Sydney Nova Scotia for August 26th. Our bikes shipped from Germany on Monday (May 5th). This is a little later than we had hoped, so it it doesn’t look like we will be going to pick them up this weekend. We are crossing our fingers in hope that they arrive in time to pick them up on Wednesday or Thursday next week. Our current plan is to leave Ottawa on June 2nd for a trip around Lake Ontario. We are now heading towards Niagara first. We plan to visit my extended family around June 7-8, and then make our way to Alfred Station, NY for a bicycle tune up on either June 11 or 12. We also wish to visit some folks in Rochester NY on our way home. We need to be home by June 22, which means we might need to take a train from Kingston to get back to Ottawa in time (although, it might be just as easy to ride!). 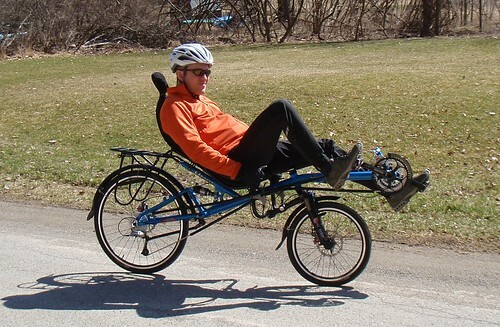 I pedal quickly, practicing my spinning. The road has a gentle decline and the trees are a dingy orange-brown, typical of the early spring after the snow is gone but before the green buds begin to take over the landscape. I remind myself to take a deep breath, smell the fresh air, and experience the moment. It was early in day one of our three day trip to southern New York State to test ride and hopefully purchase bicycle for our Grand Adventure. I had been rather anxious and stressed lately. I had not been sleeping well; my dreams filled with worry over all that still needs to be done before we can depart on our trip. A few days ago, a friend inquired about when my car would be for sale. That is when it began to really sink in. We are actually going to do this trip! Adding to the need to sell my car, I was at the end of a six-month contract. Once that finished, I would be working full-time at packing up the house and preparing for the trip. A big area of concern for me was the lack of a decision regarding bicycles. At the best of times, I do not handle uncertainty well. That may be one of my greatest challenges on this trip, the uncertainty that is necessarily part of a long bicycle journey. 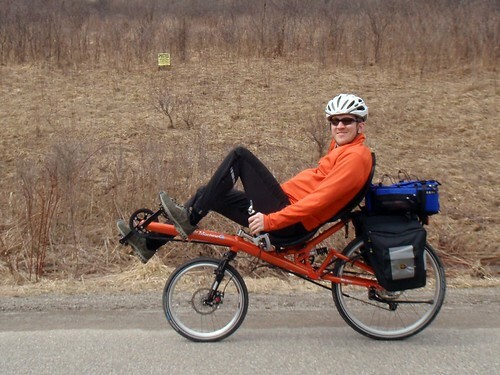 Regarding bicycles, we liked the idea of riding on recumbents, but were not certain it was the right approach. 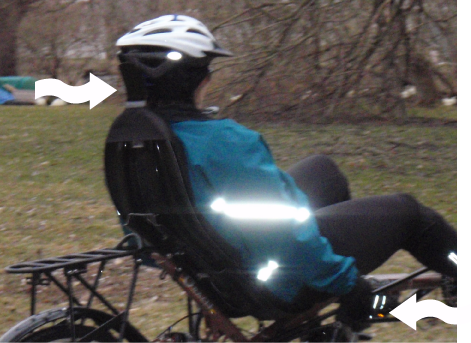 We decided to make a pilgrimage to the BicycleMan in Alfred Station New York to try different types of recumbents and see if they were right. After lots of analysis we’ve decided the HP Velotechnik Streetmachine Gte is the best bike for our needs. Peter worked hard to not influence our decision, but in the end he did tell us he agreed with us given our plans. It fit Becky better (seat fit well and she could reach the handlebars easily). It has low-rider racks available direct from the manufacturer (you can retrofit a lower rack on the Oracle Omega, but that is a work-around). HP Velotechnik has a proven reputation doing the type of long-distance riding we intend on doing (the Oracle Omega is probably fine too, but is relatively new to the market). Scott still feels a bit guilty about not supporting a Canadian company, since he was happy with both. The Gte fit Becky much better though, and it is far easier to carry spares for only one set of components. 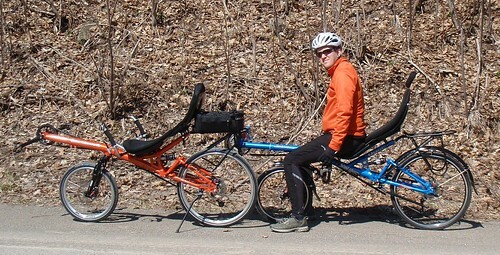 Here are some photos of our longer test ride (40 km). Scott is carrying 30lb of bricks and water bottles in the panniers to get a feeling for how the bike performed when loaded. These are Peter’s demo bikes. Scott’s bike will look similar (orange) and Becky’s will be yellow (RAL 1018). Our other major debate was Shimano XT groupo vs Rohloff Speedhub for the gear train. In one corner we had Keith (go with a derailleur! ), Bryan in the other corner (the Rohloff is really nice, and virtually maintenance free! ), and Peter somewhere in the middle. It wasn’t quite that black and white, with Keith enthusing over the engineering of the Rohloff, and Bryan pointing out that if something goes wrong with the Rohloff, it will likely be hard to fix. I had been hoping to be able to see a Rohloff hub in action (and maybe even ride a bike with one), but even at BicycleMan they’re pretty rare. They’re much more common in Europe, but in North America everyone uses derailleurs instead of hub gears. Peter mentioned that some of that is related to different import duties for hub gears vs. derailleurs in Europe. In any case, the Rohloff is very expensive here (a 35% premium on an already expensive bike by my calculations), but it does provide a much better-encased shifting system, and has proven to be very reliable for many people on long tours. That said, the Shimano XT system is very good, and extremely refined. I expect if we go the XT route we’ll spend more time maintaining the geartrain, where the Rohloff is very low maintenance. However, if something does go wrong with the Rohloff, very little is user serviceable, and what we could service is very different from a normal geartrain. We’ll need to do some work learning to adjust the cables on the Rohloff before I’m comfortable, but I need to improve my bicycle maintenance skills in any case. Another option is the SRAM Dual Drive 24-speed (this is the base configuration on the StreetMachine). For extremely long distance touring, I think this has the downsides of both a hub and derailleur. It is difficult to service and get parts for the hub, and the cassette and derailleur are exposed to mud and dirt, requiring more frequent cleaning and maintenance. Friday was dreary, wet and intermittently rainy, so we didn’t end up test driving any bikes. We did spend many hours at the BicycleMan shop though, looking at options and discussing. Since it was a grey, dreary day we pretty much had the shop to ourselves, and were able to take a lot of Peter’s time as well as some from Keith Gregory, the service manager. I didn’t realize until later that Keith is also a national cyclocross champion. Obviously, I should have paid more attention to the jerseys on the wall. Along with extensive conversations with Peter, Bryan Ball (managing editor of ‘BentRider Online) happened to be in the shop, so we picked his brain for several hours too. It was very helpful talking to all of you, thanks guys! Our final contenders for our trip were the HP Velotechnik StreetMachine Gte (Bryan’s review here), and the Oracle Omega City and Tour (Bryan’s review here). We rode the StreetMachine and both Omegas on Thursday, and I liked them all, but Becky had trouble getting either Omega set up for her. The biggest issue for her was reaching down to the handle bars. This is partly because the under-seat steering bar under the frame makes it a longer reach to the handlebars. 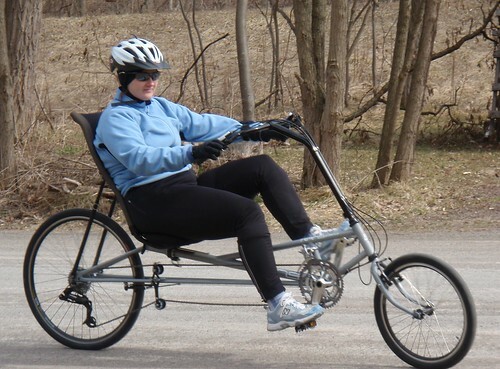 This can be partially corrected by adjusting the handlebars higher (as shown in the first picture here), but it wasn’t enough to make Becky comfortable on the Omega City on Saturday. Overall, I found the Omega Tour very comparable to the StreetMachine, and would seriously consider it. (I spent very little time on the Omega City). Becky had problems getting either to fit her well, but I’d recommend anyone interested in a StreetMachine (or an Optima Dragon or Lynxx) to seriously look at the Oracle Omega City or Tour. It is well worth doing an A-B comparison. Change the word “ride” to “buy” and you’ll have the song that has been going through my head for the last day and a half. We have this grand plan of riding our bikes around the world, but we haven’t yet identified what “our bikes” will be. We each currently have mountain bikes and touring bikes, but we are not certain that either are ideal for the trip. 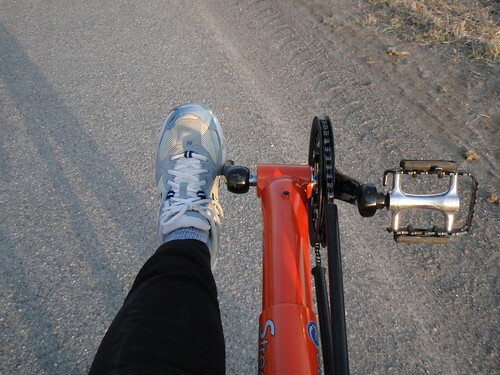 Unfortunately, I find that my road bike causes stiffness and pain in my upper back. I also fine that my wrists and hands can get very unhappy. 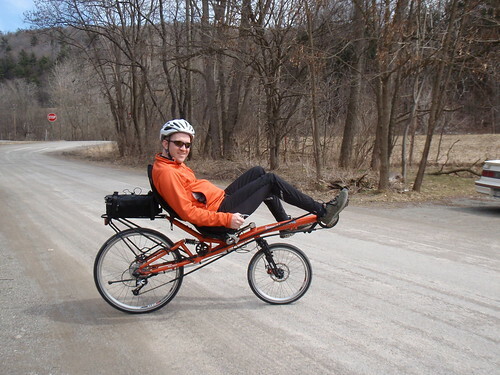 We read about recumbents as an option, but hadn’t really tried them … until today. We have ventured to Alfred Station, New York to visit Peter Stull – the Bicycle Man. Peter’s shop is in an old building that was purchased for $5,000 in 1979. It doesn’t have running water, but it does have electricity, composting toilets, and a lot of recumbent bicycles (14 different brands and around 100 bikes in stock). I did notice a few regular road bikes and mountain bikes hung from the ceiling too, but his shop definitely focuses on recumbents. 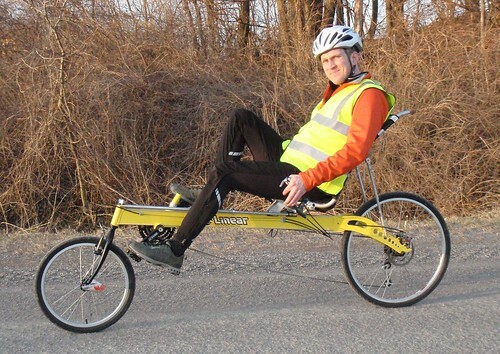 One thing about recumbents is that they are all different. This meant that you need to test drive quite a few to determine which suit you best. It has been quite the alphabet soup trying to sort through the taxonomy. USS vs. OSS, SWB, LWB, CWLB… Fortunately Peter has a nice glossary on his website, which we studied before arriving. 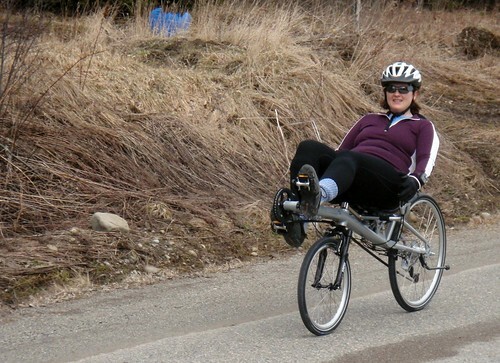 Recumbents aren’t just different from regular bikes – they’re very different from one another too! Big back tires with small front tires (26″ or 700c with 20″ front). Big front and back tires (26″ or 700c). Small front and back tires (20″). Scott on an Oracle Omega Tour. 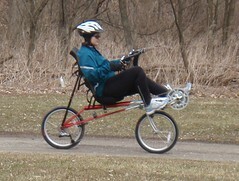 Becky on a RANS Stratus LE. Becky on a RANS Rocket. Becky on an HP Velotechnik Streetmachine Gte. Scott on the HP Velotechnik Streetmachine Gte.